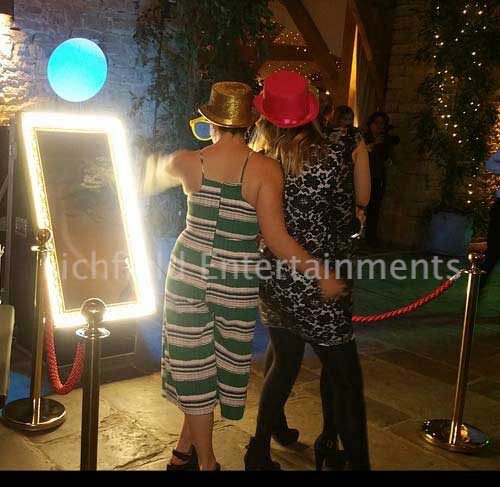 A very popular alternative to our sit down type photo booths is our Magic Selfie Mirror. While taking the photos the character 'trapped' inside the Magic Mirror interacts with your guests with on-screen messages and effects, plus animated and audio messages, both encouraging and teasing the users before issuing their print within seconds. The selfie mirror can be set to operate in one of four character modes: cheeky Eddie (the most popular), groovy 60's Austin, the more restrained Steph, or smart phone style Emojis. You can choose to have the selfie mirror take four individual photos in each sitting or have just one large photo that are issued on a 6x4inch print within seconds for your guests to take away. A set of duplicate prints in a guestbook can be added and a memory stick containing digital copies of all photos and prints is provided for the host as part of the standard hire package. 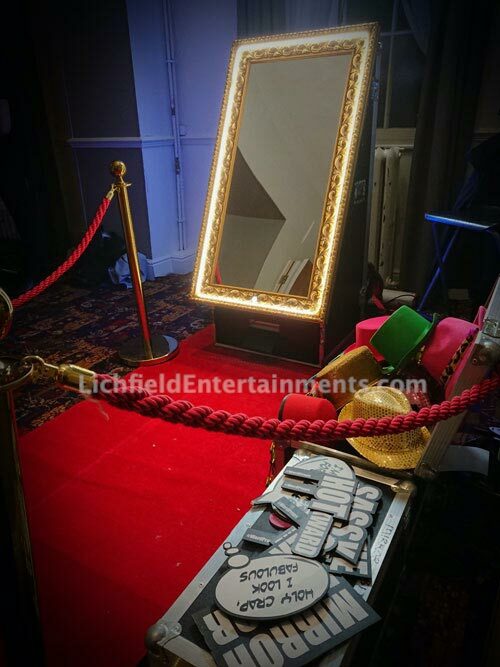 The mirror is supplied with a red carpet and matching gold and red roped stanchions for the full VIP event look. The selfie mirror uses the same quality DSLR camera, and professional sub-dye printer as our regular photo booths for the very best quality photos. 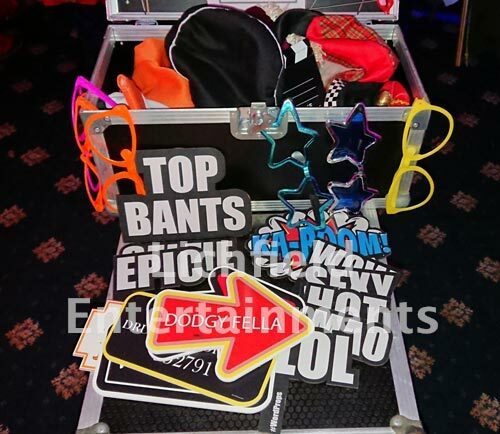 The selfie mirror comes with a box of fun props including hats, speech capsules, lips and moustaches on sticks, comedy glasses and more. An attendant is provided as standard who will ensure that your guests stand in the right position, look in the right place, and get the timings right to ensure they get the very best photos as there's nothing worse than photos with people looking down, still changing props, or having half of themselves out of the shot! 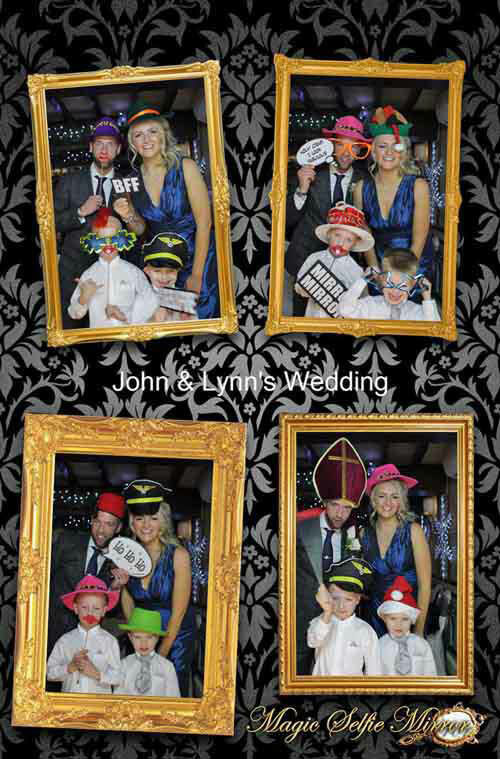 The Magic Mirror is a perfect entertainment for wedding receptions and other special occasions and its available for hire for events throughout Staffordshire, the West Midlands, Derbyshire, Shropshire and further afield upon request. The Magic Mirror can be operated in a space as small as just 9x4ft. A friendly member of staff will accompany the mirror to ensure that your guests get the very best photo results. A big box of fun props is included free of charge together with red carpet and gold stanchion posts and rope for that VIP look. An instant print is provided for each sitting and a USB stick containing digital copies of both individual photos and the prints is provided for the host. A duplicate set of prints in a guestbook can be added for a small additional fee. 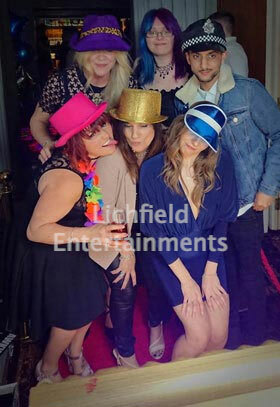 Having supplied events at all of the above previously we are familiar with these venues and know that both access and space are suitable for our Selfie Mirror, Photo Booths, and Selfie Pod. If you have any queries, questions, or would like to hire the Magic Mirror for your event please click here to enquire and we will do all we can to help.